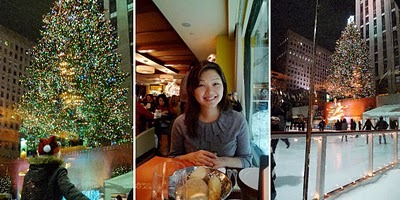 For the past 5 years, I’ve kept my own little Christmas Eve tradition – dinner by the most beloved tree. It makes up for the lack of Christmas decor in my apartment, while it paints everything Hollywood has made me believe this special night should be. I mean, who doesn’t love Home Alone 2? I grew up watching that and Christmas in NY always seemed “magical”and it is. 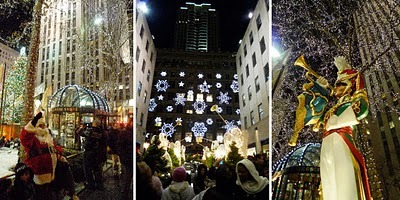 In fact, my first trip to the Big Apple was during the holidays and it was unforgettable. After church service, we headed over to dinner. 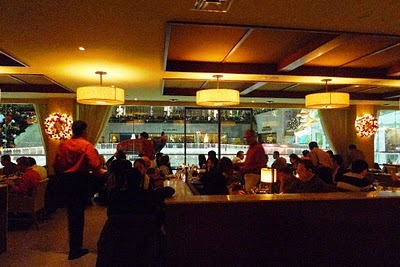 This year, we got one of the best seats in the restaurant, right by the window. 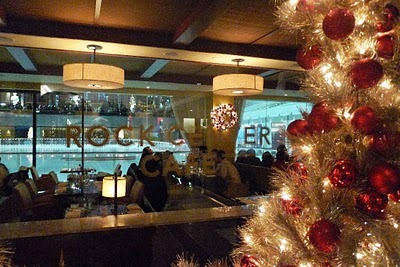 My lovely view was the famous Christmas tree in front while being surrounded by skaters all night long. I don’t usually go back to a place just for “ambiance”, after all, food is what really brings me back, BUT this is an exception. The menu here is ok, nothing special, but I like how there isn’t an outrageous prix fixe menu made up just to squeeze extra dollars out of our wallets. Everything is a la carte and service is friendly and warm. 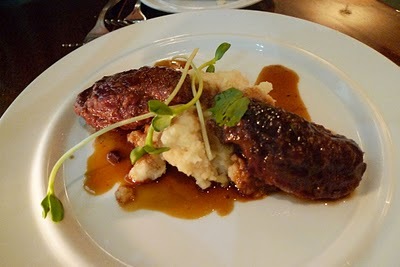 For starters we shared Braised Berkshire Pork Cheeks, served with celery and parsnip puree. Tender to the fork pork, nicely seasoned with a soy like base. It was good, not wow. 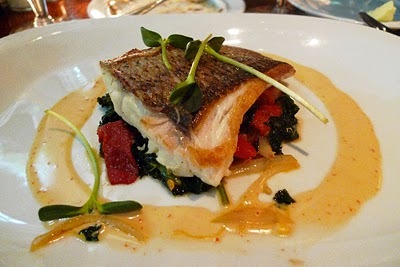 My Sea Bass was ok, I would of liked the skin to be crispier. The lobster sauce was creamy and tasty. I actually liked the bed of artichoke hearts, piquillo peppers, kale and smoked bacon best. I could of ordered a side of just that. The kale absorbed all the flavors, it’s soft yet has a slight crunch, and the smokyness of bacon and sweetness of peppers brought it together nicely. 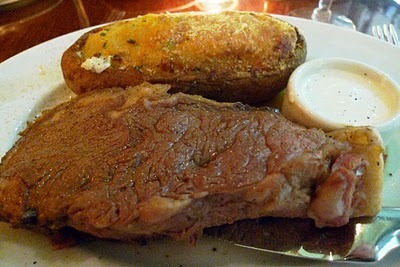 Piano Boy’s Roasted Prime Rib of Beef came cold. Yes, cold. I usually don’t suggest sending food back, but this was too hard to dismiss. I know this isn’t Smith and Wollensky, but seriously, our expectations weren’t too high to begin with. They brought it back warm and apologized, we just crossed our fingers and prayed they didn’t spit or put any “special” seasoning on it. The tuscan style double baked potato wasn’t bad with the crusty top, but not exceptional either. For dessert we shared an Apple Tart with dulce de leche and freshly whipped cream. 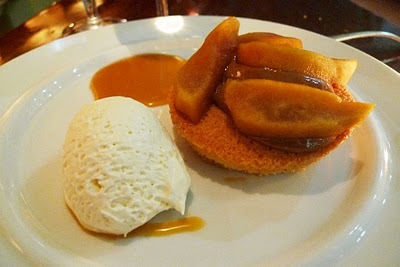 It was a little too sweet for my taste, but the caramel was really yummy and I had more than a couple spoonfuls. Dinner prices aren’t cheap, but for Christmas Eve it’s really reasonable. 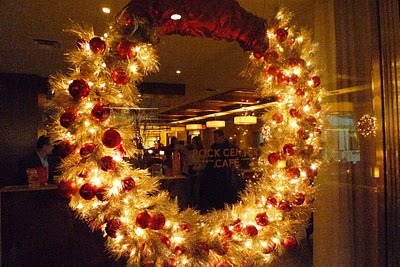 Plus I just can’t find another place with such Christmasy feeling. It makes me smile the minute I walk in, it’s cozy, modern and sleek. I guess if you’re in a Christmas mood, this is still a place to go while the tree is still around. I think it’s a great place to bring friends or family who are visiting from out of town too. Another great Christmas Eve by my favorite tree. ‘Til next year! Anyway, I love your Christmas Eve tradition. Happy New Year's too! excellent sound system as well and the drinks were strong and I had a look at the menu and thought the prices were pretty good. Guys on top of it the next day when I searched this place on the internet, this restaurant has a Face book page too wherein they post photos and updates of recent happenings/parties and upcoming events/parties/offers too. They tweet also which is really nice thinking by the owner. not hesitate to leave a comment once you are there. I know I am only going to get thumbs up from you all!!! Your photos are wonderful. sorry to hear the food was so-so. Wishing you a marvelous New Year! 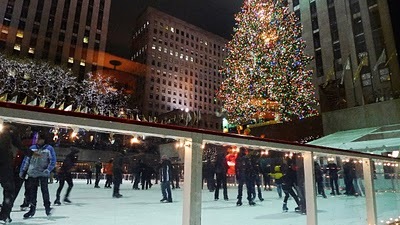 I agree – there's something magical about the skating rink and the Christmas tree at Rockefeller Center. 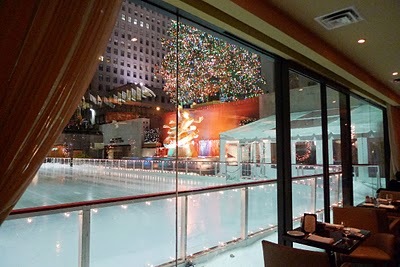 When I was in NYC last month I stopped by the rink and just stood there soaking in the "ambiance" for awhile. It was really nice. Merry Christmas! Guess what? I'll be there for New Years! YAY! Glad I can see it through your eyes! Ummm yummy cheeks and that fish dish looks fabulous! Love the holiday decorations in New York. Didn't get to see them this year, but I don't think they change too much from year to year. Tradition is good, isn't it?! Sounds like you had a wonderful Christmas dinner. Happy New Year! 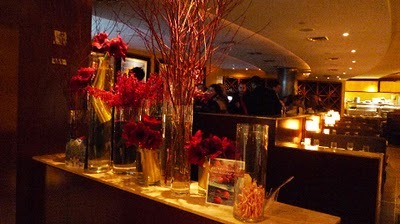 I have had dinner during the holidays at the Sea Grill which was really expensive. But we got to see someone propose on the ice rink and the atmosphere was wonderful. 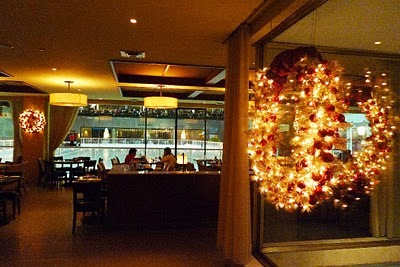 I would love to eat there at Christmas Eve. You definately got a great seat!! Great shots of the tree and decorations. i'm new… anticipation to brief around more time after time! i'm new… expectancy to post approximately more time after time!